Cologne - An extra roar of jubilation swelled up around the Signal Iduna Park as the updated Bundesliga standings flashed up on the big screen last Sunday. The added-time goal from substitute Adrian Ramos, putting the hosts 3-1 in front against his former club Hertha Berlin, was enough to take Borussia Dortmund clear of FC Bayern München and out on their own at the top after Matchday 3. For Thomas Tuchel, the win – and table snapshot – rounded out a perfect first month of competitive action as new head coach of the Ruhr district outfit. 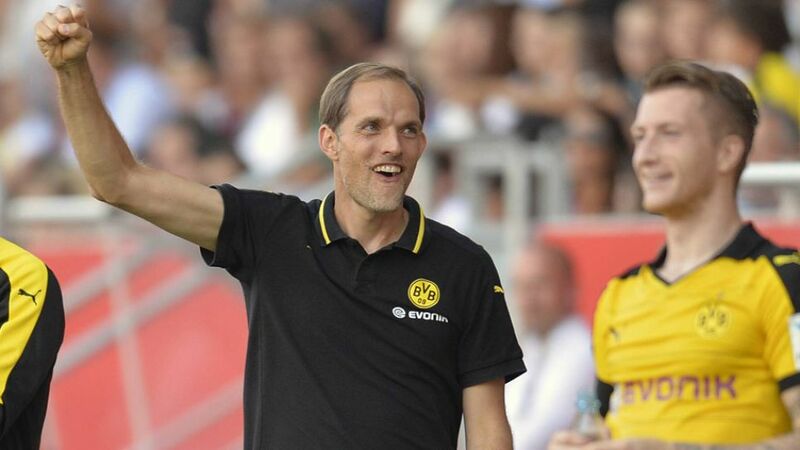 Tuchel had set out his stall early: At his official unveiling as successor to Jürgen Klopp, the 42-year-old tactician stated that, "BVB are a major challenger in every tournament we're involved in." So far, his players have been as good as his word. In addition to winning their three opening Bundesliga encounters in August, the Black-and-Yellows cruised through to the second round of the DFB Cup and rattled in 17 goals in four games to make the group stages of the UEFA Europa League. That made it eight wins in eight competitive outings under Tuchel, heading into the first international break of the campaign.